It always surprises me that members of the genus Synodontis aren't more "fashionable" in the hobby than they appear to be. Although they could perhaps claim a greater popularity in the 1980's, like many things that were popular in that decade, they did appear to have much demand at the turn of the millennium. Odd really, there are around 115 species (which, after Barbus, makes them the 2nd largest genus in Africa freshwater fishes). All are suitable aquarium fish and many different varieties find their way into the shops either commonly or occasionally depending on species. If I were a gambling man I would put a little wager that the Synodontis (and indeed the 80's!) make a bit of a comeback in the next few years. Anyway, stop thinking about where in the attic you stashed that rubicks cube and read on. This particular species of Synodontis fits nicely into the available from time to time bracket. An attractively marked fish with a very variable pattern. If anything the pattern becomes smaller but more intense with age. Well conditioned fish will often develop a bold yellow base colouration which is quite striking. Although a sociable species, fighting can break out among a group sub-adult and adult fish. Usually this is a turf dispute, but these fish have very good teeth and can make quite a mess of each others fins and flanks if you have got the environment wrong. Often this aggression can be quelled by a good water current and the addition of a few more caves and retreats. Or you could go the other way, it is interesting that if kept without any hideaways at all (including an external filter and under tank heating) Synodontis don't appear to bother about each others company or the need for privacy. Avoiding the classic combined heater/stats is a really good idea for these fish as they are infamous for jamming themselves against the glass and the heater element. This can lead to disaster, but more often the fish escapes with a nasty, permanent scar. One or two prized fish have fallen foul of this problem. The best way to avoid this either invest in under tank, external or undergravel heating systems. If your budget doesn't stretch to such things then you'll need to guard the heater in such a way that it can function safely but cannot be used as refuge. Green plastic garden mesh from your local garden centre can be used for this. Method: Surround the heater element with the mesh, you will need to leave around and inch of water between the gauze and the heater to prevent fish from burning themselves. Use a few plastic cable ties to hold the contraption together. One end can be pulled tight against the thermostat part of the heater/stat but a cable tie. The other end can either be blocked off by an appropriately sized plastic lid or put a rock or aquarium wall against it. An attractively marked fish with a very variable vermiculated pattern. Similar markings can be found on several other species within the Genus. If anything the pattern becomes smaller but more intense with age. Well conditioned fish will often develop a bold yellow base colouration which is quite striking. Other Parameters Many specimens of S. schoutedeni have a tendency to bloat. The cause of this is not yet precisely known. Feeding Omnivorous. This fish is not a fussy eater. Furniture A big pile of rocks with plenty of spaces between the rocks or a jumble of pipes are best. These should be arranged so that the fish can rest upside down or vertically but rarely the ''normal'' way up. 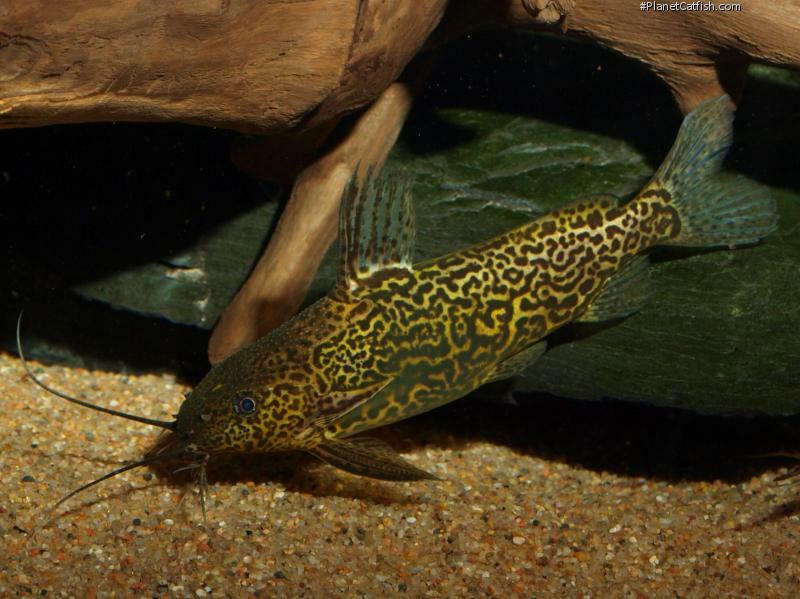 Compatibility Territorial but, as Synodontis go, unaggressive. Suggested Tankmates Larger barbs, rainbowfish perhaps and medium sized cichlids.